I had a fantastic idea the other day while thinking about fun munchies. In the summer, funnel cake is the most amazing thing ever. In the winter, I’m a huge fan of puppy chow, also called monkey munch by some. So, onto the fantastic idea, Fried Puppy Chow! Of course if you have two amazing things and you put them together you have one fantastic snack! I call this recipe an experiment because I learned a few things in the process. I’ll explain what I did and then I will explain what I think will make it even better! First, I mixed up a small batch of puppy chow. I combined the chocolate chips, peanut butter, butter, and vanilla in a microwave safe container and microwaved for about 45 seconds, mixing every 15 seconds. Then, I poured the mixture over the Chex as you normally would for puppy chow. My original idea was to add the chocolate to the Chex before frying and then add the powdered sugar after frying. Then, I mixed up the batter ingredients in a separate bowl. For frying, I heated the oil then did a test with the frying batter to check the temperature. Then, I took a spoonful of the Chex and dumped them into the batter. I made sure to get them fully coated with batter then took them out a couple at a time and dropped them into the oil. Once they were cooked, I took them out of the oil and set them on a paper towel to dry a bit. Lastly, I dusted them with powdered sugar. The fried puppy chow turned out delicious but there wasn’t as much of the chocolate peanut butter flavor as I had hoped for. Here are a few suggestions to make this treat even better! Double the chocolate peanut butter mixture, fully coat the chex, then freeze for thirty minutes before frying. I was so curious when I read the title of your post. We love puppy chow is all different ways. This could be dangerous. I’ve never even had puppy chow – I only ever heard of it recently…but after reading this ingredient list I think I need to try both versions ASAP! This looks interesting…I wold have never thought to combine these two things! I do love funnel cake though! this is amazing. I loveeee puppy chow so much, but I think it would be btter fried, if thats even possible! What a great idea! Oh goodness this looks SO good! This looks like such a good treat…great for the upcoming holidays! 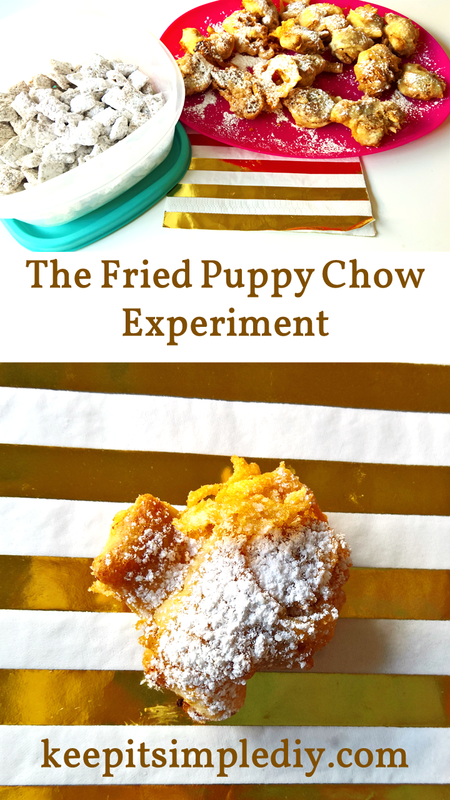 Just when you thought puppy chow couldn’t get any better….this sounds amazing! That sounds yummy! I’m a HUGE fan of funnel cakes. Maybe this will be something to make with the kiddos!